Game of Interest #1 Stony Brook St. John’s1211This was easily the most hard-fought game of the day. Stony Brook pulled out the victory, but it was certainly a nail-biter. Stony Brook has one thing going for them, and one thing going against them. They turned the ball over 10 times to 6 times for the Red Storm. But they shot 32% vs 23% for St. John’s. As a result, their offensive efficiency was 2 points better, and in a game where possessions where just about even, that was the difference.Tension Game Score: 59★ ★ ★The tension game score for this game was 59, which indicates an extremely close nail-biter.Stony Brook Min. Win Probability: 18%★ ★The lowest win probability that Stony Brook had at any point during the game was 18%, which suggests that you would not fault those that switched over to something more compelling.Lax-ELO Points Transfer: 16★The victory means a transfer of 16 Lax-ELO points from St. John’s to Stony Brook. As a result of this transfer (and the rest of the games played), Stony Brook moves from 46th to 45th nationally; St. John’s goes from 57th to 59th. Game of Interest #2 Monmouth St. Bonaventure75The Bonnies jumped out to a 3-0 lead over the first 10 minutes of the game. At that point, they had a 68% chance of winning. Of course, a first quarter win probability is worth about as much as a snowball stand in January, and unfortunately for Coach Mearns’ crew, it didn’t last. Monmonth outscored them 7-2 over the remaining 50 minutes to claim the win. Whether a comeback starts in the first quarter or the fourth, you have to give a team credit for taking a punch and staying focused.Tension Game Score: 84★ ★The tension game score for this game was 84, which indicates a game that was more swing-y than tight throughout.Monmouth Min. Win Probability: 21%★ ★The lowest win probability that Monmouth had at any point during the game was 21%, which suggests that you would not fault those that switched over to something more compelling.Lax-ELO Points Transfer: 27★The victory means a transfer of 27 Lax-ELO points from St. Bonaventure to Monmouth. As a result of this transfer (and the rest of the games played), Monmouth moves from 59th to 57th nationally; St. Bonaventure goes from 60th to 60th. Game of Interest #3 Bucknell Marist107LaxWP Game PageThe Bison took this one on the strength of a solid defensive effort, holding Marist to just 7 goals on 39 possessions (18%). Both units played above their season averages for Bucknell. One thing that stands out for the Bison though was shots/possession. They had 1.17 in this game compared to .87 on the year. Getting extra chance was huge for them as it extended possessions (leading to a TOP advantage) and allowed them to overcome a poor shooting day.Tension Game Score: 85★ ★The tension game score for this game was 85, which indicates a game that was more swing-y than tight throughout.Bucknell Min. Win Probability: 22%★ ★The lowest win probability that Bucknell had at any point during the game was 22%, which suggests that you would not fault those that switched over to something more compelling.Lax-ELO Points Transfer: 34★ ★The victory means a transfer of 34 Lax-ELO points from Marist to Bucknell. As a result of this transfer (and the rest of the games played), Bucknell moves from 48th to 42nd nationally; Marist goes from 46th to 52nd. Game of Interest #4 Syracuse Hobart and William175LaxWP Game PageRead our RecapThis was the marquee game of the day…on paper. In reality, Syracuse pushed the Statesmen around in what ended up being a non-competitive game. Syracuse stepped up in all 4 facets of the game, which really obliterated some of the advantages that Hobart looked like they might hold heading in. Hobart was a team that had top-15 units on both offense and defense and a top-10 FOGO in Pedicine. So while Syracuse will need to record some more wins on the ACC slate, this game will definitely go down as one of their more impressive victories.Tension Game Score: 126★The tension game score for this game was 126, which means that it was not a very tight affair for the most part.Syracuse Min. Win Probability: 27%★ ★The lowest win probability that Syracuse had at any point during the game was 27%, which means that while things never get truly dire, this was an uphill battle.Lax-ELO Points Transfer: 66★ ★ ★The victory means a transfer of 66 Lax-ELO points from Hobart to Syracuse. As a result of this transfer (and the rest of the games played), Syracuse moves from 28th to 15th nationally; Hobart and William goes from 9th to 26th. Game of Interest #5 Canisius Cleveland State1019LaxWP Game PageTension Game Score: 159★The tension game score for this game was 159, which means that it was not a very tight affair for the most part.Cleveland State Min. Win Probability: 29%★The lowest win probability that Cleveland State had at any point during the game was 29%, which means that while things never get truly dire, this was an uphill battle.Lax-ELO Points Transfer: 34★ ★The victory means a transfer of 34 Lax-ELO points from Canisius to Cleveland State. As a result of this transfer (and the rest of the games played), Canisius moves from 37th to 40th nationally; Cleveland State goes from 51st to 47th. 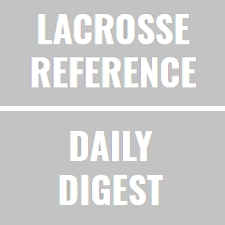 ‹ LacrosseReference Recap – Hobart vs Syracuse	› Shots per Possession: Do we care?